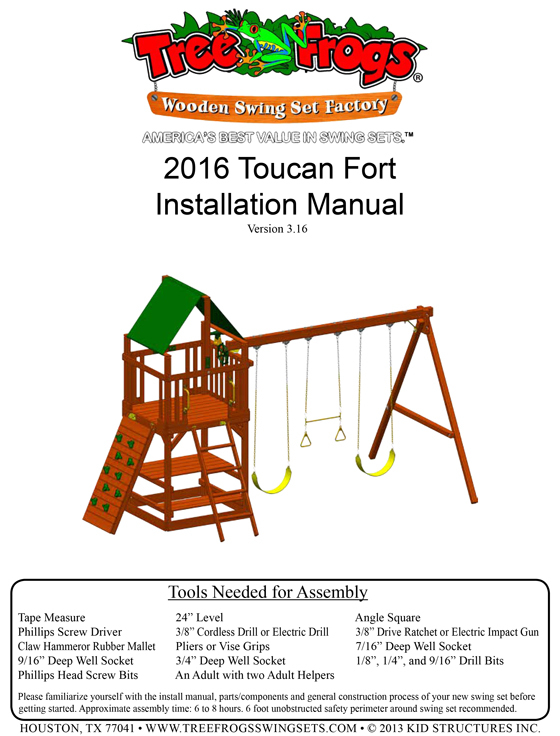 TOUCAN FORT features 2 belt swings, trapeze with rings, yellow double wall wave slide, and picnic table below the fort. 55″ RAISED 14 SQ FT DECK with wood roof, open deck space with telescope and ship wheel. 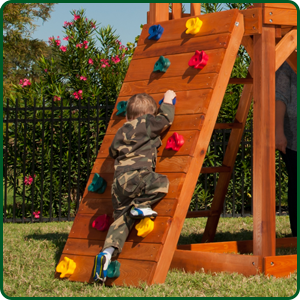 FULL SIZE ROCK WALL with 10 multi-color rock holds and wood step entry ladder with safety handles provide 2 entries to fort deck. THREE POSITION INSIDE SWING BEAM with 1 blue belt swing, 1 red belt swing and 1 trapeze with rings. 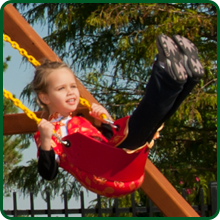 The swings are made to comfortably withstand up to 150 pounds per swing. This product is intended for Residential Use only. Tree Frogs Toucan Fort with Wood Roof is a colorful and entertaining swing set that features a picnic table for lunch on those beautiful afternoons away from the electronic devices. 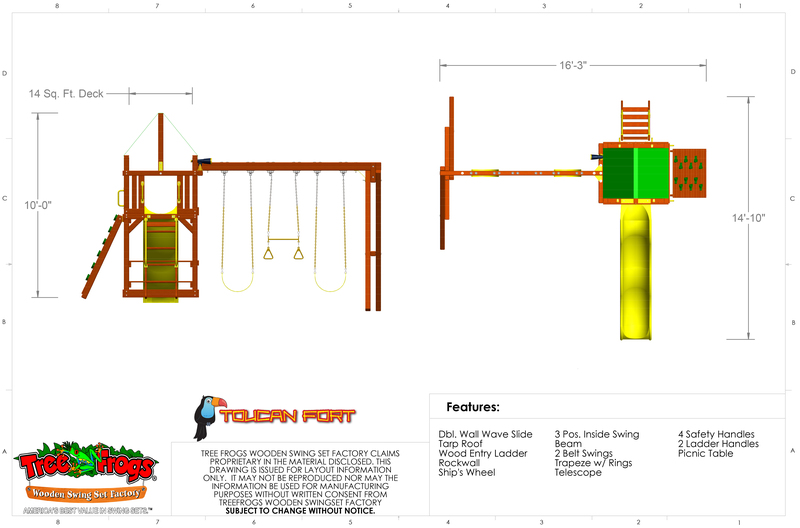 Parents and kids alike can spend endless hours enjoying the Toucan Fort swing set. 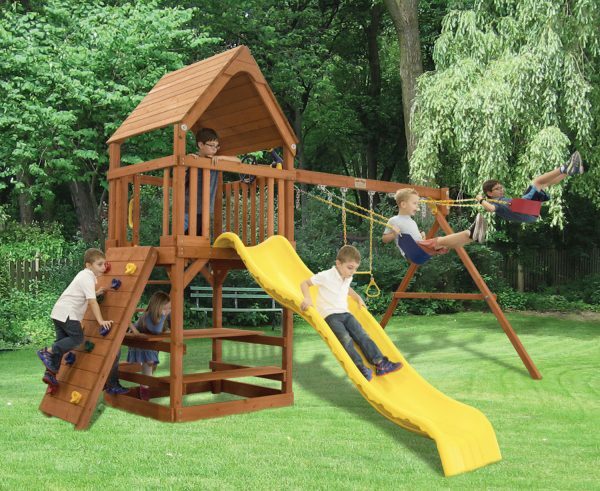 By using 100% All Natural Premium Cedar solid wood our swing set offers many advantages like dimensionally stable boards that will remain flat and straight with minimal warping or cupping. We only use solid timber for unmatched structural integrity and we never use glued timbers (laminated wood). 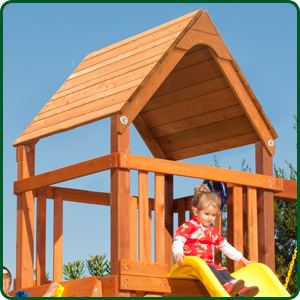 We use larger timbers on our swing sets allowing not only the kids to have fun but also Mom and Dad. Wooden Entry Ladder with 2 Safety Handles ensuring safe and easy entry and exits from the fort. Rock Wall has 10 durable multi-color rock holds ensuring safe and easy entry and exits from the fort. Fort has a 55″ Raised Deck with an open 14 sq. ft. deck area, along with its wood roof, telescope and pirates ships wheel. Double Wall Wave Slide features a smooth wave design with wide handrails for a super safe but speedy slide. 3 Position Inside Swing Beam with 1 red belt swing and 1 blue belt swing provides exciting hours of fun for the whole family. Below the raised deck is an awesome Picnic Table where kids can talk for hours and the possibilities are endless! You will love this unit! 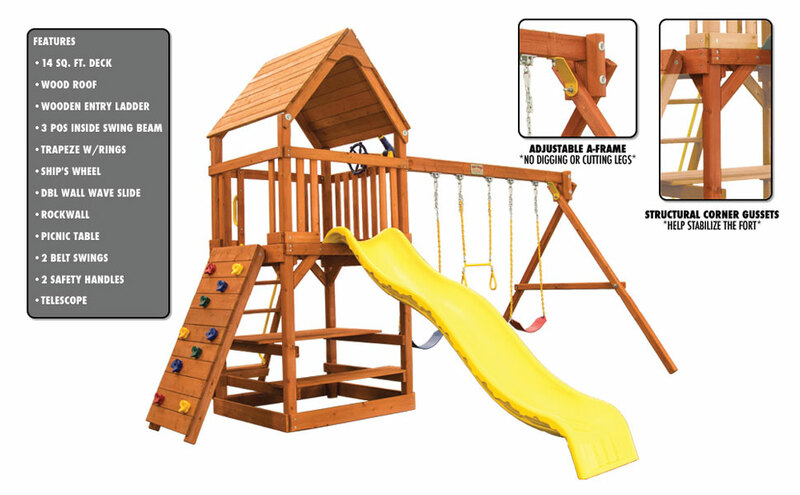 The Toucan Fort is made from 100% All Natural Premium Solid Cedar Wood and includes pre-cut, pre-drilled premium stained lumber, fast and easy bracket system, 1 double wall wave slide, a solid rock wall with 10 multi-color climbing rock holds, 1 red belt swing, 1 blue belt swing and trapeze with rings with UV plastic dipped chain, and an easy to follow instruction manual. 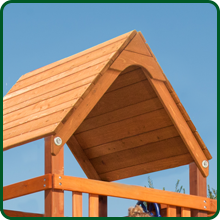 Assembled dimensions are 16′-3″ Long x 14′-10″ Wide x 10′ Tall. Also has 55″ raised deck that is 14 Sq. Ft. and a 9 foot long double wall wave slide. Remarkable Dimensional Stability- the wood doesn’t change size or dimension despite weather, humidity or temperature conditions. The Toucan Fort has no laminated wood in its construction.Laminated wood is multiple boards glued together. The fun and challenging Solid Rock Wall features 10 multi-color durable rock holds that builds endurance, muscle strength and confidence while enhancing coordination and fine motor skills. One of the 2 ways to safely enter and exit this fun and exciting fort. The Solid Wood Step Entry Ladder w/Safety Handles is another safe entry and exit from the fort. The 2 safety handles is an added safety feature to the connected upper fort. The Double Wall Wave Slide features a smooth wave design for an exciting ride that will transport your child swiftly and safely as they embark on a thrilling sliding adventure. Features Wide Handrails that allow younger sliders to slow their progress as they come down the slide. Your child is sure to enjoy this thrilling slide again and again! Raised kids 14 sq. ft. fort deck with Wood Roof has an open space with an awesome telescope and a pirates ship wheel to really take you on an amazing adventure and your imagination can take you anywhere in this fort! Below the fort is also a Picnic Table! 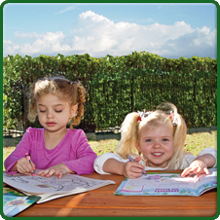 So, use your imagination for drawing or sit and talk with friends for hours! The possibilities are endless for this swing set! The 3 Position Inside Swing Beam provides hours of active fun for the family with 1 Red Belt Swing, 1 Blue Belt Swing and 1 Trapeze with Rings. This action-packed swing beam provides exercise and fun simultaneously. The swings are also adjustable height with chain and spring clip assembly. Adding more character to your Toucan Fort is the beautiful Wooden Roof. 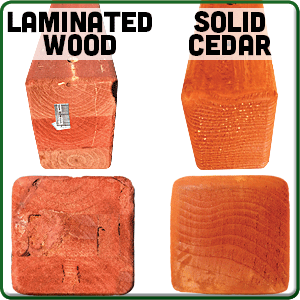 Provides a more appealing architecturally clean design to fit into your landscape. 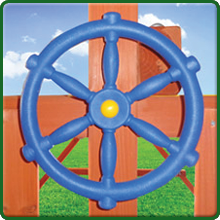 Your kids swing set doesn’t have to be an unpleasant sight in your well manicured backyard landscaping. Below the deck is also a picnic table with 1 bench seat!! So, use your imagination and play and talk with friends for hours! The possibilities are endless with this fort!! 55″ Raised kids 14 sq. ft. deck with Beautiful Wood Roof has an open space with an awesome telescope and pirates ship wheel to really take you on an amazing adventure!! Aye Aye Captain!! Box 1 of 3: 20-½” Wide x 10-¼” Tall x 48-½” Long — 152 lbs. Box 2 of 3: 20-⅞” Wide x 7-¼” Tall x 120-¼” Long — 184 lbs. Box 3 of 3: 12-⅝” Wide x 6″ Tall x 45-⅝” Long — 58 lbs. Yellow Double Wall Wave Slide: 108″ Long — 41 lbs.